-Granulated sugar — 1 C.
-Vanilla sugar — 1 pack. 1. First of dilute gelatin in 150 ml of hot water. Leave to cool down. 2. Dilute according to instructions, jelly 300 ml of hot water. Also give cool. 3. «Crisps» break in half. You can take other crackers (sweet) and finely them to break. 4. Sour cream, sugar and vanilla sugar and whisk thoroughly. When the mixture is churned, add the cooled gelatin and whisk again. 5. A chocolate bar (preferably pre-cooled in the freezer) with a knife finely break. 6. In a bowl with sour cream, add the cracker and steamed raisins. Thoroughly kneaded. 7. Get split form. Spread 1/3 of our cream. Gently sprinkle it with chocolate. The chocolate spread another part of the cream and sprinkle again with chocolate. Then spread the remaining mass. The form put in the refrigerator to harden for 30 min. 8. Until cream stiffens, pulls out a grape, cut it in half. 9. 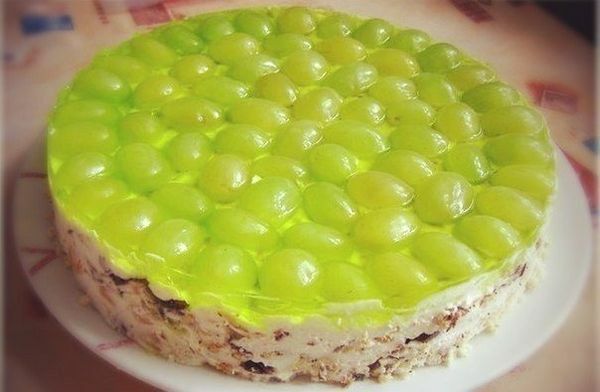 The grapes are gently pour the green jelly. Put in the fridge to full hardening of jelly, you can leave for the night.